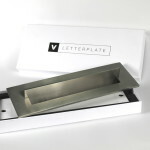 Draughtproof Letterplate, made in the UK, guaranteed for 10 years. 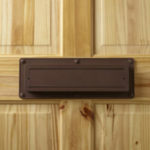 Our draughtproof Letterplate will solve your letterbox problems. Its smooth action, attractive design and robust materials guarantee you years of use, rattle-free. Order by 4pm Monday to Friday for next day delivery – Buy Now. Why is this the ultimate Letterplate? 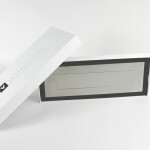 Our draughtproof Letterplate opens to let through the post you want with a featherlight touch, never ripping or biting post or parcels. It lets deliveries through and closes immediately. It doesn’t blow open, even in a hurricane. It is draughtproof. It doesn’t let in rain. There are no brushes to wear out nor springs to break. No hinges to rust and nothing else to corrode, even in salt spray. We guarantee it will work for 10 years. 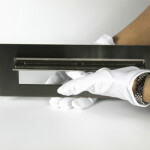 We use only marine grade 316 stainless steel for all our letterplates, and at nearly 2Kg it is no lightweight pretender. 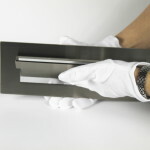 Each Letterplate is professionally hand polished and finished. 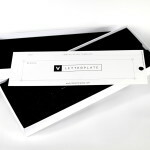 We can customise The Letterplate and produce it in any size. 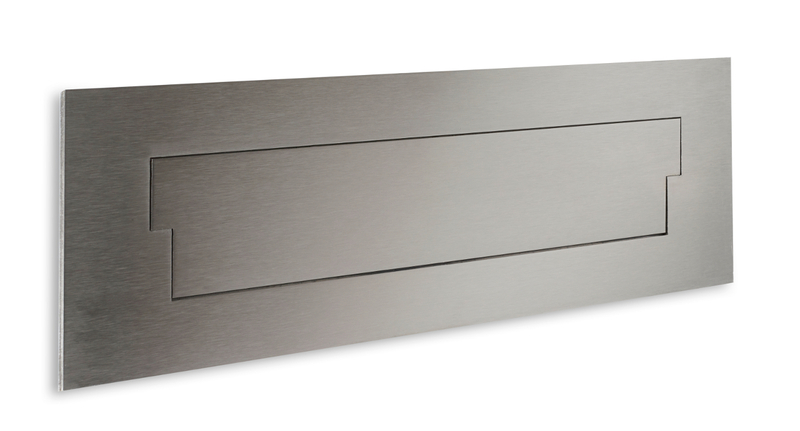 You or your architect can now put a stainless steel draughtproof letterplate on your door without compromise. 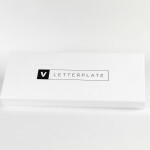 The Letterplate is designed and built in the UK using advanced laser cutting techniques and a modern finish. We have made fitting The Letterplate to the door simple. We supply The Letterplate itself, a card with a template for the door hole and mounting and mounting screws for doors 20mm to 70mm thick. 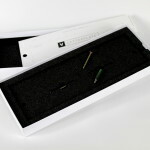 Many standard external doors are 45mm thick and for those you need only use the screws provided. For doors over 45mm thick you can use the supplied chrome extension adapter and the screws. The screws are strong snap-off screws so you can reduce the length in 5mm intervals to suit the thickness of your door and have a flush finish on the inside of the door to minimize issues with rear tidies, baskets etc. If the current hole in your door is too small you will need to alter it to meet the minimum size as shown by the template 240mm x 50mm. 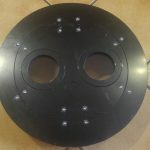 If you have a slightly larger hole in the door then so long as the Letterplate’s outer plate (300mm x 100mm) covers it and mounting lugs (265mm apart) can be accommodated in the door fabric there should be no problem in fitting and use. NB Some may find a thin bead of sealant between the door and the back of the Letterplate helps to seal against uneven door surfaces. We do not have thousands of letterplates in a warehouse. They are made in small quantities, each is tightly quality controlled. This means we can quickly spot any quality issues and ensure we are giving you our best at all times. Our Letterplates depend on highly skilled and professional men and women in the UK who take pride in producing a brilliant product. That means we don’t have to ship the product between continents or rely on uncertain manufacturing conditions, rather we are supporting the high value skills available right here in the UK. We are not expecting you to buy a new Letterplate every few years. Ours are built to last many years, with high quality, stable, weather resistant materials. Those materials are highly recyclable and have well understood chemistries and predictable behaviour. That’s why we offer a 10 year working guarantee. We do not have a long list of options and styles; rather we’ve settled on a practical, well-designed product. If what we stock is not right for your needs, we can custom design and build one especially for you, so it too will be brilliant. We determined the best solution to fit most quality doors and we produce that and sell it online. Check your door size by heading over to our shop now, then select and buy it. Order by 4pm and it arrives couriered to you next day. Should you need something different for your letterplate then contact us and let us know. 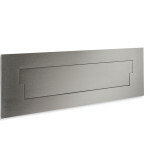 We will talk you through all the important aspects and design a custom version of The Letterplate just for you.